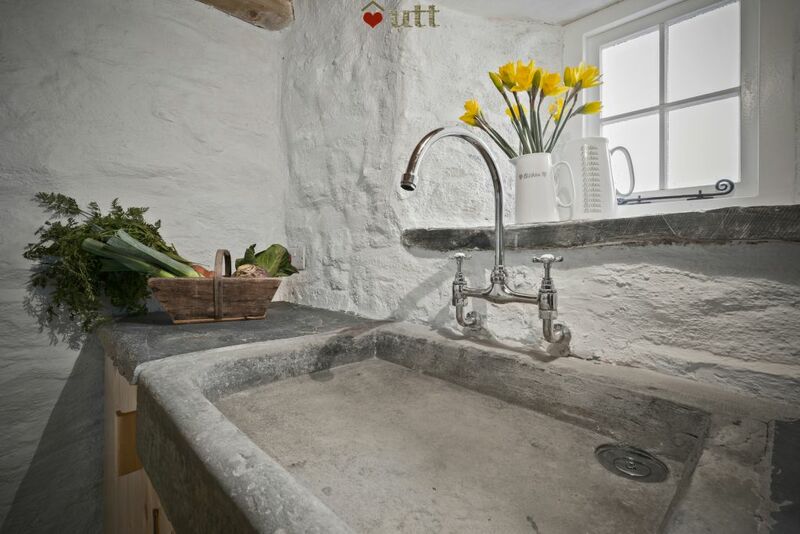 Welsh limewashed holiday cottage in Carmarthenshire, Wales. 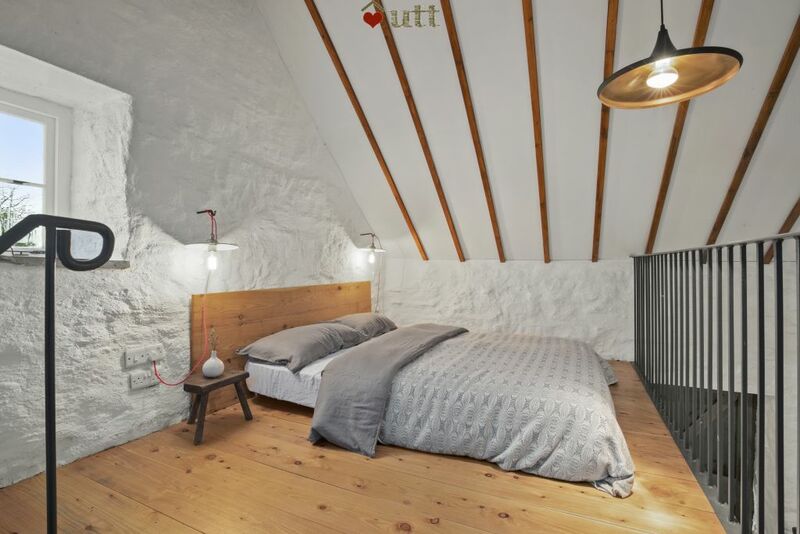 Fabulous rustic-chic interior, perfect for those Instagram moments! A respite from the modern world, Tŷ Unnos is a simple, delightful retreat. This modern rustic property is unlike anything you'll find through your average holiday cottage agency. 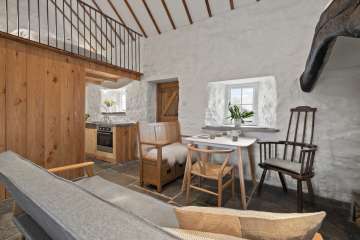 It is exactly what 'Under The Thatch' is all about - simple, rustic, and authentic, private...and very comfortable. Originally built from local materials in an old-fashioned way, in just one night as per tradition, Tŷ Unnos is a typical croglofft cottage – an open-plan living space with a sleeping loft over. We're delighted to re-launch it now for 2019, after a year of closure and renovation. 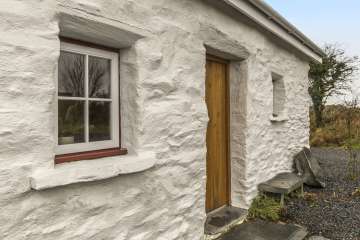 If there are more than two of you, the property is down the same track as UTT Bryn Eglur, but each cottage enjoys privacy. What a magical place to stay, a wonderful recreation of an original Ty Unnos. Great attention to detail in the interior,loved the use of curved wood and literally sleeping under the thatch! 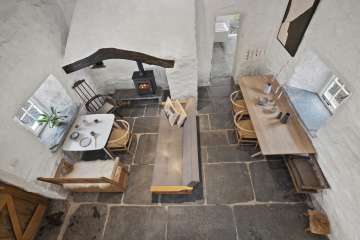 Living room area with slate floors and whitewashed walls reflect the light and make for an open and calming place to eat, sit and read. A large freestanding wood burner is ready for lighting on cool winter evenings. 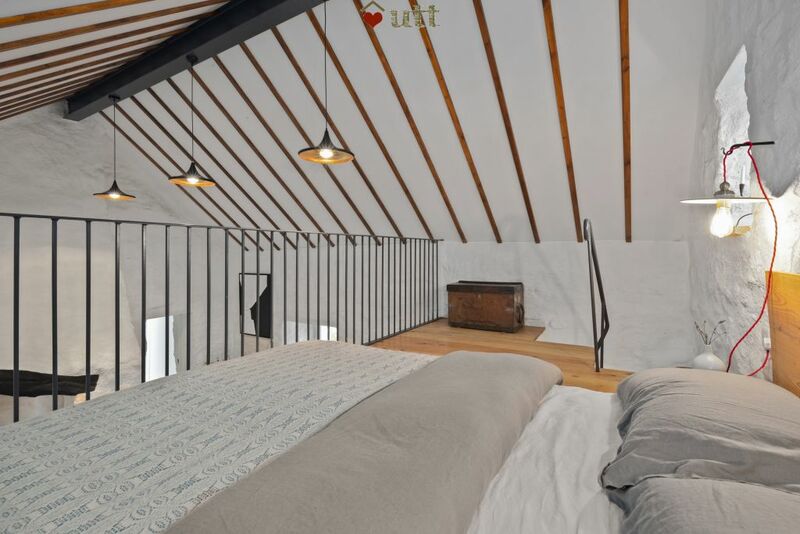 Sleeping loft is up some fairly steep stairs. Kayaking/canoeing and lessons - 12 mins. We had such a lovely stay. Secluded location and very peaceful. 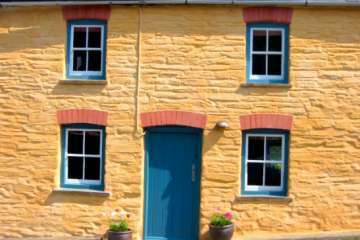 Great attractions near like Dylan Thomas' boathouse and the botanical gardens. A fairly close drive to the seaside resorts of Tenby. We would definitely stay here again! 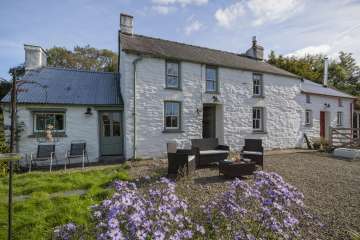 Ty Unnos was just perfect for a short break away from it all. A very interesting, cosy and peaceful place to stay. Fantastic to get away from the hustle and bustle of the 21st century and pay a visit to the early 19th. Really interesting to flick through the photos and story behind the building of this fascinating place - hard to believe that it is only ten years old rather than 200! A great experience. Absolutely perfect and Dorian is the most generous and delightful host. I had seen photos of the cottage, but nothing prepared me for the tranquility and peace it exuded. 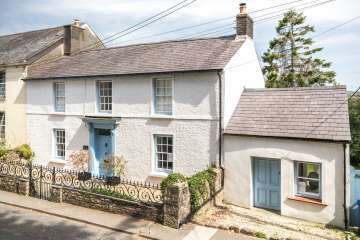 The cottage had everything we needed, from the fluffy white towels to the heated towel rail and underfloor heating was an absolute bonus.Feather and down pillows and duvets were also a surprise. I brought my own along, but I didn't need them! Dorian was a very friendly helpful host and gave us plenty of information about the area and where to visit. I highly recommend this cottage. It's rustic but with modern amenities, it's the perfect retreat in the countryside, quiet, rural but near enough to visit towns and villages. Wonderful nest to curl up in and rest. Free from any outside intrusion with no phone or wifi thankfully just the sneaked appearance of a friendly cat. Will return . 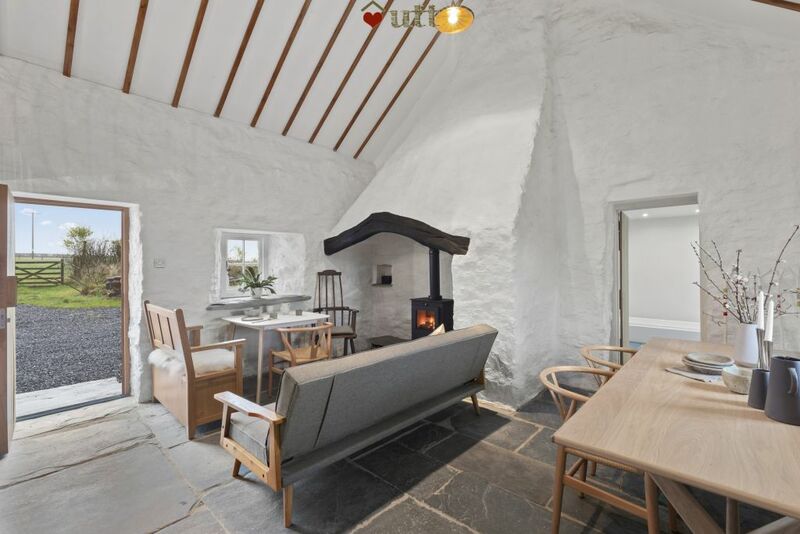 A really exceptional cottage. Cosy, warm and authentic. Beautifully furnished. A real taste of Wales! The cottage is fantastic- so peaceful and relaxing. Dorian was very welcoming especially carrying some extra logs. Perfect location to visit the beaches at Poppit and Pendine- we will definitely be back. I would recommend this cottage to anyone who wants to get away from it all. It is in a beautiful, hidden, location down a bumpy track. 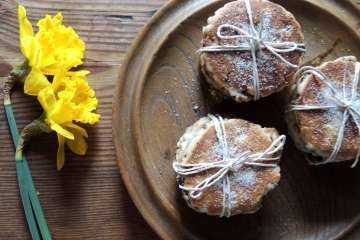 Dorian kindly provided a 'starter pack' of Welsh cakes and eggs and told us something of the history of the site. We had everything we needed for a comfortable and cosy stay, with interesting woodland walks close by. What an amazing place! A beautiful, healing, calming space. The cottage folds you in, taking you back in time, to a more simple way of life. The stress just seeps away as you watch the changing light play on the walls, from sunrise to sunset. The surrounding countryside offers many hidden gems and is a place of both awesome vistas and cosy nooks and crannies. Sitting in front of the flickering fire, with Mrs Jones the cat and a glass of something lovely - who could ask for more? 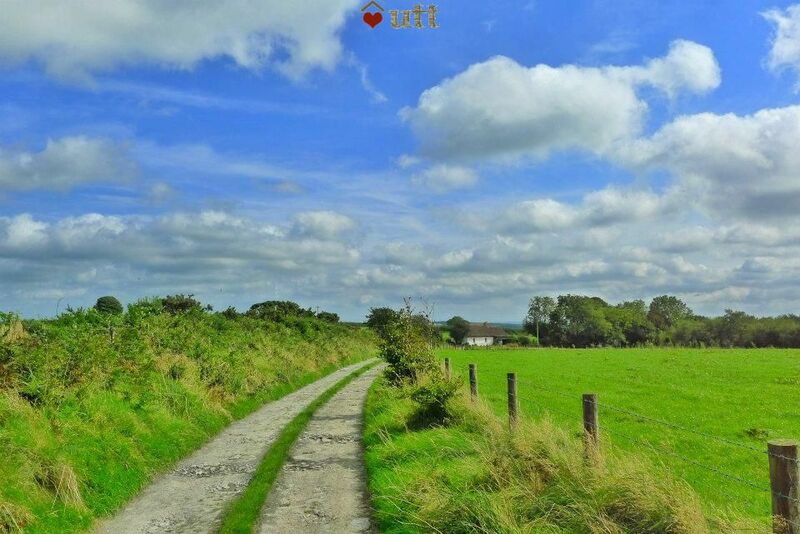 Ty Unnos is quite simply a slice of Carmarthenshire heaven! We arrived in the mist and were instantly spellbound by its stillness, simplicity and calm allure. A step back in time that remarkably avoids pastiche and instead evocatively honours an uncomplicated past. 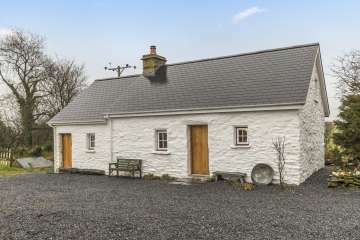 To fall asleep listening to the rain on the thatch and then to awake to early morning sunshine was perfection in itself and although we explored the surrounding area during our stay, the cottage seduced us to linger and just experience its calm, uncluttered serenity. We simply sat, we absorbed its ambience, we listened to nature, we re-read some favourite books and we left utterly refreshed. Feel privileged to discovered and stayed at such a perfect retreat. 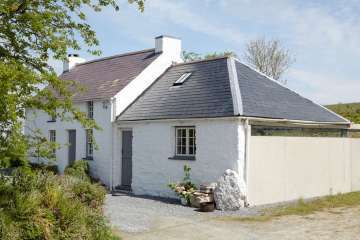 Dorian, at Ty Unnos you really have created a wonderful experience - we can hardly wait to return there or to one of your other cottages. Llongyfarchiadau! 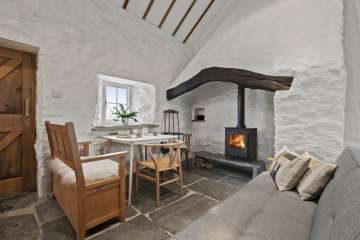 Ty Unnos is a charming property that provided us with the chance to experience a little traditional style living. We appreciated the peace, seclusion and opportunity to reflect. Dorian is a good host who took care to ensure we had arrived safely on the first evening and who checked we had all we needed. The house has everything needed for a pleasant break and helped us to imagine what life might have been like in a pre-digital time. The cottage did get chilly and so we appreciated being able to light a fire. The local cat, Mrs Jones, was an added bonus each evening and we looked forward to her visit! All in all a lovely weekend away. A wonderful, peaceful break. We enjoyed the cottage and exploring the surrounding coastal areas. Dorian was very welcoming and we enjoyed Mrs Jones' frequent visits. A top tip is to bring some slippers as the floor is beautiful but quite cold! Thank you for such a lovely week. We had a wonderful, relaxing long weekend in Ty Unnos. The cottage was everything we'd hoped - so welcoming and full of atmosphere - so much so we didn't want to leave. We also enjoyed our evening visits from Mrs Jones - a real character! Ty Unnos was even better than expected. The cottage and setting are BEAUTIFUL, and Mrs Jones the cat came to visit us every day. Would recommend trips to Barafundle beach, St Davids, Whitesands Bay, Narberth. Already planning a trip back - would definitely recommend! We had a lovely time in the beautiful Ty Unnos. 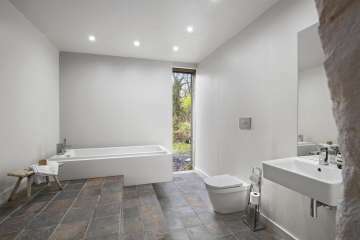 It's been so brilliantly restored combining authenticity with modern comforts.. the underfloor heating was a dream, along with fabulous bathroom. 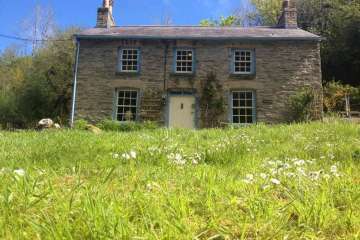 Two lovely sunny spring days, walking, relaxing and celebrating our friend's birthday - staying in Bryn Eglur next door! It was such a lovely week in Ty Unnos. Peace, beauty, simplicity, I loved everything about it and can't wait to return. Absolutely brilliant ! The cottage is exactly as described and we had a wonderful time. 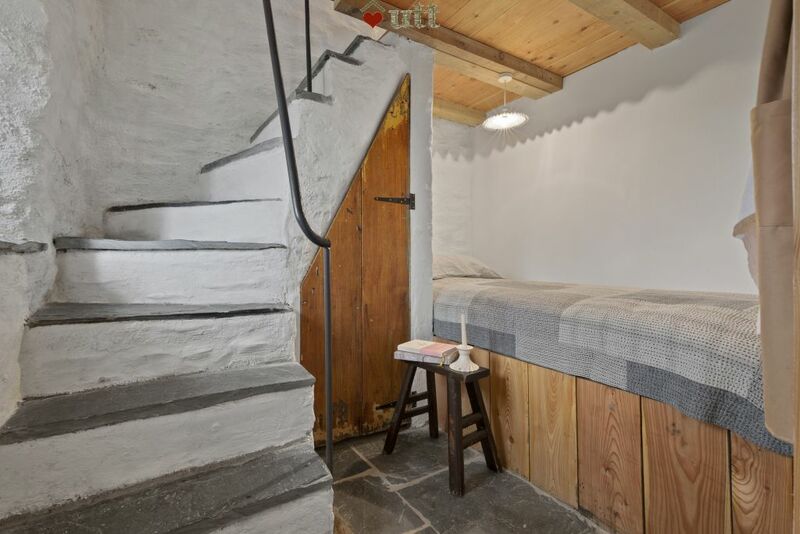 If you didn't know it, you would think this had indeed been built in the 1800s but Dorian has incorporated just enough modern features to make life comfortable including a large, warm bathroom and underfloor heating. As we have an open fire at home, we took three bags of logs with us and my husband really enjoyed cooking all our meals on the woodburning stove. It is pretty and peaceful and made a lovely Valentine's retreat for us. I would recommend it highly. Wonderful stay. The cottage is beautiful and so peaceful. The underfloor heating is marvellous and the woodburner works really well. Some softer lighting would be great - a lamp or two in the main space. An amazing property and friendly, helpful owner. It was a joy to wake up and contemplate the roof ! This stay prompted a visit to St. Fagans which showed us how true Dorien's reproduction was. 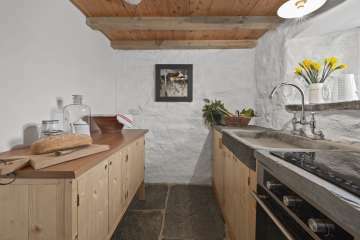 Ty Unnos is a project beautifully undertaken. We admired the skill and dedication displayed in every detail in this authentic reconstruction. My wife, whose family come from Narberth, recognised many of the pieces of furniture from her childhood. We thoroughly enjoyed our brief stay and experience of a simpler life. The cottage was beautiful. Haven't seen another like it. The feeling of it was very cosy, thanks to the thick walls and thatched roof but it didn't feel cramped due to the high ceiling and spacious bathroom. Dorian was very helpful and the small details of the decor made the cottage feel like a home, as did Mrs Jones the cat who came to say hello most days. This cottage is rural and rustic and so quaint. Such a peaceful place the only sounds being the birds. We loved it and the owner was kind and friendly. The dogs loved it and we enjoyed everything about our stay. All brilliant. 5 year old daughter loved the box bed, pictures, interesting ornaments etc, fields to run around in and, most of all, the cat. Great experience to be able to stay in such a unique property and in a fab location too :-) P.S.- Dorian was very helpful with our last minute booking and even more so when we locked ourselves out. Thanks very much!